What is unclear communication costing you? Can every team member in your organization explain what your company offers? And can they do it in such a way customers want to place orders immediately? If not, you’re losing money. How many customers are passing up your products? How many of your team members don’t understand why their work matters in the overall story? How many of your leaders aren’t respected or listened to? Not communicating clearly is already costing you millions. CHANGE THAT STORY TODAY! Send your trainers to get certified. Take your teams through the curriculum. Communicate clearly and grow your company! Most companies are teaching their employees to speak an inside language that does not connect with customers. This critical mistake is costing them millions. Once your teams learn to communicate clearly, they will stop using confusing language and finally talk about your products from the perspective of the customer. This means your websites will be clear, simple and convert browsers into buyers. Your sales scripts will work. Your salespeople will empathize with your customer’s problems and position your products as the resolution to those problems. Your teams will be unified around a common mission and, finally, your company will start to grow again. If you have a great product that isn’t selling as much as you think it should, you’re likely talking about that product in a way that is confusing. Once you clarify your message, customers will listen. Let us train your trainers to teach our workshop. 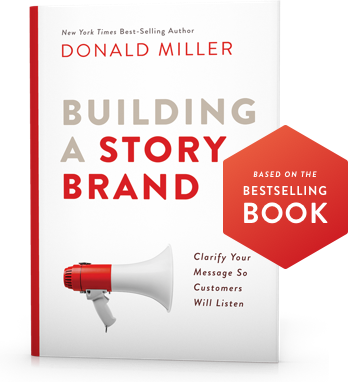 Once they are trained, they will teach your people the StoryBrand 7-Part Framework and your organization will be transformed. Remember, if you confuse, you’ll lose. But it doesn’t have to be that way. When your people start communicating clearly, your customers WILL engage and your company will grow! Apply today and let’s transform your organization. Want us to train your facilitators?